The following information is in regards to our initial set up. It has been almost 3 years since we wrote this. Many upgrades and improvements have been made since then. All can bee seen on our Youtube Channel. Updated wiring diagrams, specs and photos will be coming soon. In the meantime, much of the below information is still accurate and I’m sure you will find it useful. And the answer to our most asked question is YES, we still love our electric motor! An electric motor . . . Lets first take a look back in time when “production” boats became popular in the late 60s early 70s, the intent was to make an inexpensive boat the average family could afford and handle with limited sailing experience and knowledge. As a result, one of their requirements was the ability to move the boat in difficult situations. This is where the "auxiliary engine" was coined. But, for many, it has become the primary means of maneuvering their boat. Yes, there are places in the world you can’t sail, like the Panama Canal. But, there are often alternatives where you CAN sail. As of today, November 2016, we have sailed over 3000 miles up the east coast of the United States and through the Bahamas to Haiti. We have yet to use our motor for more than 30 minutes at a time. The majority of use comes when we drop the mainsail and back down on our anchor to set it. Most of our sailing has been off shore. But, we have also sailed on the ICW and recently sailed 25 miles up the Cape Fear River to Wilmington, NC. We have sailed under many bridges, some on set schedules, others open on demand. In all cases, we sailed under. We have found that, having a solid plan and the patience to wait for the right weather and tide is the key. After all, we own a sailboat. They are inherently slow. We are not in a rush. We love the idea of being self sufficient. But, for those who sail with schedules, are short on time, lack the patience to sit out a wind hole, feel the need to power their boat to hull speed, enjoy maintaining a diesel engine or are just set in their ways, then an electric motor probably isn’t the right choice. Want to learn even MORE...? Of course we would love for you to stick around and read this page all the way to the bottom, but, we have tucked in many distractions (i.e. links) along the way. Don't feel bad if you digress, we know you'll be back. If you want to just jump feet first into all things "electric sailboat" Electric Seas is a good place to start. It's a great resources community and features several other electric sailboat stories for you to enjoy. "My Electric Boats" by: Charles Mathys. Although this book is currently on our Amazon wish list, we have not read it yet. But, it is the only one we could find on the subject and, for only $15, it looks promising. If you read it before we do, let us know what you think! First, keep reading, we might answer them below. If not, head over to The Electro-Beke Forum and ask them there. You don’t need a diesel . . .
"We have no schedules requiring that we make it back to the dock on time." Many people have written in and commented that an electric motor is only good for day sailors who weren’t going very far each day, and that you need a reliable diesel engine for long distance cruising. But we feel like the opposite is true. Since we don’t have a dock to tie up to and charge our batteries each night, we rely on sailing to recharge our system. The longer we sail and the more sun we get, the more power we make. Because we don’t have a 9-5 to return to at the end of a fun weekend out on the boat, we have no schedules requiring that we make it back to the dock on time, no matter what the wind is doing. So, we feel that an electric motor, depending on your sailing style, can be adapted to any boat. But, you have to be willing to work around the one major draw back, range. Range is the one major downside to an electric motor. But, with a sailboat, and some adequate sailing skills, we have found we really don’t need a motor as much as we originally thought. For those who do have schedules, the possibility of a hybrid system may work well. It encompasses all the benefits of an electric system with the added back up of a diesel or gas genset rated to supply adequate power for extended motoring. Some companies even offer an electric motor, like this one, that can be installed in parallel to an existing diesel motor. So the majority of motoring is done with the traditional diesel, however for short periods of time, like moving around the marina, the electric drive can be used instead. This also incorporates the added benefit of capturing power from the spinning prop while sailing, often referred to as "regeneration" or "regen". Our conversion to electric . . . It was rated at 4.8kW at 36v which was adequate for our needs. It was overbuilt for an industrial application. This meant it had robust parts and easy to source replacement brushes. The motor cost us $125! Since this entire “Electro-Beke” project is just one big experiment, we tried at every corner to keep our expenses minimal. Our motor weighs 110 pounds, which is quite a bit more than its brushless DC siblings like those used in the existing electric boat market. Although it is probably a little less efficient, its components are much more robust and durable. It is heavy duty, low cost and provides adequate power, with the added bonus of being simple and easy to find parts for. The only parts we will likely ever have to replace are the 8 carbon brushes that transfer electricity to the motor armature (the part that spins on the inside). Depending on use, they can last for many years without wearing out, and for about $80 we can buy a complete replacement set to have onboard. That's it, virtually maintenance free, with only 1 moving part, the motor itself is relatively simple. On our boat, simplicity is often the defining factor for equipment selection. This motor happens to be wired with separately excited field and armature (or SEPEX). It just means that we have a lot more control over the motors power output. We can tune it down to have more low end torque, or up to gain high end speed. This will allow us to customize the power output we need for our specific boat. A few other types of motors out there include, Series, and Permanent Magnet that only have one set of coils. Each type has its own benefits and drawbacks. But we won’t get into any of that here. If you would like to know even more about DC motors, click HERE. we didn't buy new . . .
See their calculations for our boat HERE. Click HERE to see our quote from Annapolis Hybrid Marine for a Thoosa 7000HT motor. Read their prediction for power consumption and battery drain HERE. Click HERE to see some data and predictions from Electric Yacht for their Quite Torque 20 motor. Our entire set up . . .
As you can see by the above quotes, The motors and supplementary wiring are all in the $10,000 price range. That doesn't include a battery bank. Our motor and wiring cost us just under $500. Many of our components were refurbished, used or salvaged from boats being demolished, including some of the wiring. The battery bank and additional tools, like wire crimpers and cutters were another $500. So, for about $1000, we installed our Electro-Beke system. Our charging system ended up costing us only $400 thanks to a few amazing companies who joined our Uma Angels Family and supplied the major components. Find out more about our charging system in the "Charging" section below. $500 _ for the motor, controller and supplementary wiring. $500 _ for the batteries. $400 _ for the solar charger, panels and bimini modifications. Power required . . .
to push our boat and yours. "'Hull speed' and 'redundant power' weren't something we worried about in our system." Our motor has an 8hp rating. For those accustomed to gas or diesel engines, this may not seem like much power. But, the rating systems used for gas engines and electric motors are so different that comparing the numbers is almost meaningless. It comes down to the way the two types of motors use their energy and torque curves, which is quite different. According to the research we have done, a 1 hp gas (or diesel) engine can push 500 pounds of displacement to hull speed in calm conditions. Now, the sources disagree a little here, but as a rule of thumb a 1hp electric motor can push about 3 to 3.5 times more displacement than its petrol equivalent. So a 1hp electric motor, drawing 750W, can push about 1500 pounds of displacement. Our boat displaces 13,500 pounds. So, 13,500 / 1500 = 9hp electric motor. Now 1hp (of electric) draws about 750 watts. So, 9hp x 750W = 6.75kW electric motor. Hover over any point to see exact data. For example, it is estimated that at 2.7 kts our motor will draw 600 watts (blue), giving us a range of 65 nautical miles (grey). This graph is based on a 14kW Lithium battery bank and a high end motor/controller combo. At 48V, our motor should give us 6.3kW, which is slightly less than what we would need to push our boat to hull speed in calm conditions. But that is something we never intend to do. It takes a lot of power to push a displacement boat to hull speed. So the slower you go, the greater your range will be. However, it takes a long time to cover that distance. So, there is a sweet spot right around 4 kts (see graph to the right) where you make good headway, while being conservative with your power consumption. Of course, these are merely suggestions. Real world conditions are rarely perfect and adding 30% redundancy is often recommended by many motor companies. We only use our motor for close quarter maneuvering where sailing isn't an option, like a marina, or tight anchorage, so "hull speed" and "redundant power" weren't something we worried about when designing our system. We often sail on and off the hook and choose places to anchor with few boats around. Here are some great companies . . .
that instal, sell, or can help answer your questions. Thunderstruck-EV and EV-West are staffed by great people who would love to hear from you and help answer any questions you may have. They both offer DIY kits that will suit the needs of any boat. They can also help source adequate battery banks, help with solar and even find local experts to assist with installations as well. If you're looking for a more "plug and play" set up, check out the companies below. They represent the best in the industry and will gladly customize a set up for your specific needs and provide a detailed quote. Here is another great article about "How much electric power do you really need? For the complete parts list and wiring diagram, scroll down. "...all we had to do was figure out how to get the motor to spin the prop." There is a lot to talk about here. Hopefully you can follow along and not fall asleep. Like…I …….am…….right….nowwwww(yawn)www... SLAP!!! Ok! I’m awake. Where was I. Right, wiring. With no degrees or formal training in electrical engineering (and no, they didn't teach us this stuff in architecture school), we had a lot of learning to do. Here we were, with a big heavy electric motor we knew nothing about, a boat it could theoretically push and the dream it would all work in the end. Now all we had to do was figure out how to get the motor to spin the prop. Sounded simple enough…right? This step, of course took the longest. Since all our components were used, refurbished or salvaged, we had to test everything. We then started wiring the system in pieces in the salon and testing those. We then modified, adjusted, replaced and fabricated new systems and tested those. In all, it took us 9 months from motor purchase, to moving boat. Granted, not all of that time was devoted to installing the motor. We did have a few other projects on the side. The motor we talked about previously. In all honesty, the main concern when sourcing a motor, is that it has enough power (watts) to push your boat to the speed you would like. The second concern is that it will work with the voltage of the components you choose. 12/24/36/48/72/96V are all common. The general rule, is that the higher the voltage, the fewer amps need to be pushed through the system to attain the same wattage. With this in mind, we have found that 72/96V systems tend to be more expensive than similar 48V set ups and, pushing a boat requires much less power that pushing a car. So, we’re not worried about running hundreds of amps through the system. Although rated at 36V, we run our motor at 48V so we can utilize available golf cart components for the rest of our systems, which are also inexpensive and abundantly available. For our boat, we designed the system to handle 150 amps. This would give us a theoretical output of just over 7kW (48V x 150A = 7.2 kW). If you were paying attention earlier, you might notice that our motor is rated for only 4.8kW at 36V. That is a continuous rating however. It can handle more, but cannot sustain it for long periods of time without some external cooling system. But, because there are times when we need all the power we can get, like stopping or backing down on the anchor, we decided to run our system with a higher amperage rating to accommodate that need. Check out these photos of our final installation. This little box is the heart of an electrical conversion. Similar to the head of an ICE (internal combustion engine), it controls the speed at which the electric motor spins. It does this by breaking up the power stream coming in from the batteries into tiny little pulses. This is called Pulse Width Modulation or PWM. There are many different types of controllers out there. In general, if you found a motor with standard voltage range, there is a controller on the market that will work for it. Some are more complex than others. Some offer built in regen capabilities, while other require computer programing and digital displays. Our controller is a Curtis 1209B. It is designed to run a series motor, but since we got it for such a good deal, we made it work with ours by only using it to power the armature. See the wiring diagram below for more details. This controller is not fancy. It is weather proof, simple and robust. If you haven't figured it out by now, we love simple and robust. We will explain more below in the "BATTERIES" section. But for now, as long as you can create a battery bank that can be wired to produce the required voltage for the rest of your system, then you'll be fine. Also keep in mind how much space and weight the bank will require. Ours fit perfectly where our old fuel tank used to be and helped offset all the weight we lost by removing the tank and the old diesel motor. For typical lead acid banks, at 36V you will need 3 -12v or 6-6V batteries. A 48V bank will require 4 or 8 respectively and so on. Although you can purchase massive deep cycle batteries with equally large aH ratings, we don't see the value of them since it is very difficult to maneuver them into tight spaces on a boat. Ideally, if you can afford them, a lithium bank would be the best for an electric motor conversion. We'll talk more about them in the "WHAT"S NEXT" section below. All our wires our tinned copper or "Marine Grade", although, we despise that term since it often just means "more expensive." The majority of which, we scrapped off of boats that were being demolished at the boatyard. What we couldn't find for free, we purchased from a local discount marine store that sold surplus marine components. This allowed us to spend very little for all the wiring. For the most part it is all oversized, but when it comes to wire, the bigger the better. There are many useful online calculators that can help give an idea of what size wire will be appropriate for a given application. If your wiring is undersized, the system will lose some efficiency. For the most part this is of no concern. However, in extreme circumstances it will heat the wire to the point of melting things. For example, we undersized the cables connecting the motor controller to the armature, after a 15min full power test at the dock, we melted off the heat shrink tubing on the terminal lugs. It was quickly replaced by something much more beefy and hasn't been a problem since. O yeah, One More Thing . . .
Oops, almost forgot. Somehow we had to keep the motor inline with the transmission and securely mounted to the boat. We built and re-built 6 different mounting brackets prior to the one we have now. Each being fabricated after hours of sketches and models were developed. We didn't have to modify the motor any or the transmission itself. However, we did modify the original transmission adapter plate that was used to attach it to the back of our Westerbeke. We then securely attached the transmission to the hull of our boat. This allowed the motor to float in front of it, leaving the transmission to absorb any thrust from the prop. We fabricated the brackets out of steal since it is easy to work with and weld. Once we settled on a final design, we epoxied and painted the brackets and motor with engine enamel. We're quite pleased with the final outcome. All the exposed metal is protected from corrosion and it is very securely mounted to the old engine pan. In tandem to our bracket iterations, were several attempts to connect the motor to the transmission. Our early versions were poorly aligned causing horrible vibrations that in turn produced noise. Noise was something we were trying to avoid by going electric. The final design paired two identical sprockets, connected inline by a #50 double roller chain. This seems to work quite well. It allows for small misalignments and produces the least amount of noise. There are of course many other options out there, and someday we may experiment with them. But, for now, this set up works for us. Take a look through our Electro-Beke playlist on Youtube for video of the installation process. Here it is. The schematic you've all been requesting. You may notice that it is drawn for a direct drive system, where the motor is used to electronically shift from forward to reverse. We have since installed our motor in front of our old transmission and no longer need the Fwd/Rev circuit. However, since the majority of set ups out there use the motor to achieve Fwd/Rev, we wanted to show our diagram depicting a similar set up. If you end up with a Series or PM motor, you should be able to modify this diagram by excluding the 12V bank to motor connections. However, many of the components, like the contactors, require a 12V supply to operate their solenoids. So you will still need a 12V accessory bank. This is often the house bank of a boat, since many smaller boats run 12V house banks anyway. Below are the components we used, why we chose them, where to buy them and pictures of them installed in our boat. If you didn't figure it out already, their letters correspond to the diagram above. This is a simple automotive fuse held in an inline fuse holder. It protects the ignition circuit wiring from drawing too much amperage in the event of a short. The key switch is mainly for security. It can be replaced by a simple on/off switch, but taking the key out will slow down someone trying to leave with your boat, without your permission. This switch is only needed if you are planning a direct drive system. We no longer have need for it, but also have yet to rewire our system after we installed the transmission. It is a basic rocker switch with an on/off/on rocker and 6 pins on the back. This allows both positive and negative wires to be switched. We also wired ours so that it will shut off the contactors if switched accidentally while the throttle was engaged. That way it wouldn't cause any damage to the motor. The throttle tells the motor controller how much power to send the motor. We chose this one because it allowed us to keep our existing throttle lever and cable mounted on the steering pedestal. It also has a micro switch that we use to close the secondary contactor (N) on the 48V side and the Fwd/Rev contactor (E) on the 12V side when the throttle is pushed forward. This ensures no voltage is going through the system until the throttle is actually engaged. This, again, is not needed if you, like us, install the motor with a transmission that handles Fwd/Rev. However, if you are planning a direct drive set up, and the controller you chose doesn't have a Fwd/Rev circuit, then this is a necessary evil. The one we used, we scrapped off an dead windlass. It works great for the 12V circuit and are easy to find. Our boat came with this switch installed already. We simply rewired it slightly to accommodate our systems. For now we only use the "Battery 1" and "off" settings. However, if we eventually install a DC-DC converter to bring our 48V bank down to 12V we could wire it to the "battery 2" position as a back up battery bank. Pretty basic here. A buss bar is used to connect multiple leads to the same source. This one is beefy to handle high amperage on the positive side of the 12V circuit. Same as the Positive buss bar above. However this one is tied into the 48V circuit. These are pretty standard. They are required to hook up an amp meter and measure how much amperage is running through your system. Often an amp meter will come with its own shunt. They sample the current so that not all 100+ amps are running through a meter. That would be very dangerous. Just make sure the shunt and meter are rated for the same mV, usually 50mV or 100mV. These fuses protect the wiring in the system. The closer to the battery bank the better. The fuse on the 48V side is rated for 200A and the 12V fuse is rated for 80A. These are rated for amperage only and can usually take a variety of voltages. Both fuses and holders are identical. They just have different ratings. This contactor is wired to the main key switch. It is a bit redundant but shuts off any power from the controller, motor and gauges. It acts more like a battery shut off. This contactor supplies the motor controller with the power it needs to run the motor. It is also the one that is bypassed by (T) the pre-charge resistor. Contactors are just big remote activated switches. Like breakers, they activate very fast to eliminate high amperage arching. The motor controller we chose works for our application, but there are many out there to choose from. Do your own research here before deciding on what motor you will use. We happened to get a sweet deal on ours so we made it work with our motor. Our system would be less complicated if we used a controller designed for a SEPEX motor. The Curtis 1209B that we have is designed for a Series motor, but we make it work. Sorry, you'll have to find this one on your own. Since another motor like ours has yet to show up again for sale online, we can't really recommend the same one. However, the basic idea is finding a motor with the appropriate wattage to push your boat. Refer to our "Power Requirements" section to get an idea of what that might be. Then just make sure it will produce the desired power at a voltage that you would like to work with. We recommend 48V for most applications for reasons described previously. These attach to the shunt (J & M) and show you how many amps are running through the system. Depending on where it is placed it can either read the amps being drawn from the battery bank or the amps going to the motor. We decided to read the amps being drawn from our batteries. This meter does not require a shunt. As long as the negative lead makes its way back to the negative buss bar, the positive lead can be attached at any point along the circuit. We chose again to read the battery bank voltage with ours. However, it can also be place on the motor to read the voltage there instead. There is no specific item to show you here. Each controller and each set up is different. But, I can tell you that the pre-charge resistor is very important. It by-passes the main contactors and supplies the motor controller with the power it needs to pre-charge, so its ready when the main contactor is switched on and all that amperage comes rushing in. 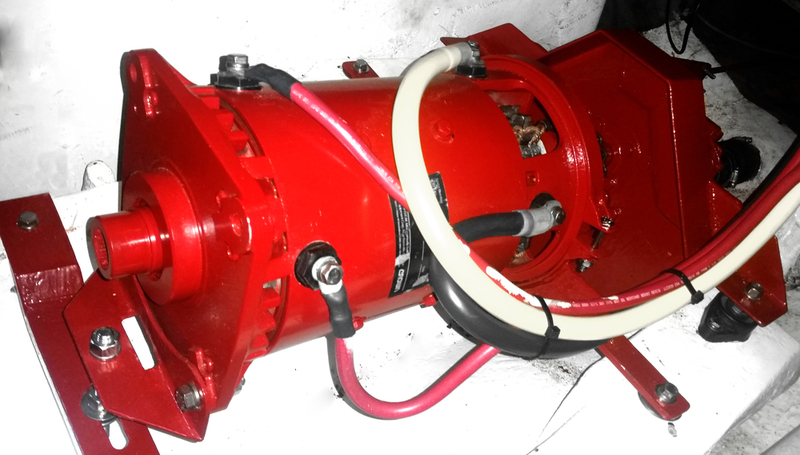 Make sure you check out SV Bianka's page for another detailed blog about his electric motor installation. For another great article about all the other stuff that goes into a motor installation, you might want to read "Balance of System". The article is for an electric motorcycle set up, but the basics are similar enough. One thing we learned very early on was that . . .
"The more watts you can store, the longer you can push your boat." At first we thought (please don’t laugh we were total newbies) that if we took 4 - 12V batteries with 125aH, and wired them in series, we would get a 48V bank with 500aH capacity. Obviously we forgot everything we learned in high school algebra. We soon resolved our mistake and learned that this formula is at the heart of everything electrical. As you can see, Watts are the thing you need to pay attention to. Remember high school physics? W=Work. Many appliances in your house, often things that produce heat, are rated in Watts, but marine stuff tends to rate things in Amps. Well, for our sake Watts are king. No matter what boat you have, it requires a certain amount of work (Watts) to push it through the water at any given speed. So, your job is to charge, store and supply to the motor a similar amount of wattage in order for your boat to move. The more watts you can store, the longer you can push your boat. As mentioned before, our motor is a SEPEX motor. This meant that the field and armature needed 2 separate voltages in order for the motor to spin. The way we solved this problem was with two separate battery banks. The field is powered by the house bank at 12V. This bank consists of two deep cycle batteries wired in parallel giving us about 250Ah at 12V. So far, it has held up great. It powers everything onboard including the inverter and laptops. We use about 30Ah on a slow day at anchor, and around 70Ah when sailing or when we’re both using our laptops all day at anchor. The nice part, is that even on a cloudy day, our 480W solar bank can replenish that before dinnertime. But we’ll talk more about that in the next section, “CHARGING" below. The motor bank consists of 4 - 12V deep cycle batteries wired in series giving us about 125Ah @ 48V. This may not seem like much, but in the last month of sailing, we have logged over 1000 miles, including sailing 25 miles up the Cape Fear River, and have never depleted the motor bank more than 35%. That works out to drawing only 44Ah used. We’ll talk more about range and testing below in the “TESTING” section. There are many types of lead acid batteries on the market. Don’t get too invested in brand. Most of the batteries on the market today are made by the same two companies. Trojan seems to be the brand of choice for many. We found batteries for sale locally and for $100 each, including delivery, we couldn’t pass them up. We also knew that the flooded lead acid bank we installed is only temporary. Like we’ve said before, this whole “Electro-Beke” thing is really one big experiment. We have plans to install a LiFePO4 bank soon enough. But we’ll tell you all about that in the “WHAT’S NEXT” section below. There are many inefficiencies in electrical systems, like heat. However, don’t worry about them too much. If you budget 30% power redundancy into your system, it will more than cover any losses from heat, or mechanical friction and so on. Check out www.batterystuff.com. They have useful calculators for battery banks and solar, along with great information on different types of batteries and what they are used for. Our Solar System . . .
We have 480 watts of solar. Broken down into 2 - 240W panels at 24v wired in series to give us a nominal voltage of 48V. Did you get all that? Great! Steven, from Solar EV Systems, gave us a great deal on them, landing him a spot in our Uma Angels Family. There are a several types of solar panels, but as far as we can tell, any modern panel is efficient and well made. None are much more efficient that others, it’s more about the size of your mounting space, and the size of your wallet. The ones we have are made by Trina, HERE is a link to their data sheet. They are not expensive, look well made and perform exactly as promised. The nominal voltage of a panel could also be called the “conversational voltage.” When we talk about the voltage of the panels and the other components of the system, we’ll most often use the nominal voltage. Nominal voltage actually refers to the voltage of the battery that the module is best suited to charge; the term is a “leftover” from the days when solar panels were used only to charge batteries. The actual voltage output of the panel changes as lighting and temperature conditions change, so there’s never one specific voltage at which the panel operates. Nominal voltage allows us, at a glance, to make sure the panel is compatible with a given system without having to look at the exact voltage. Our panels have a nominal voltage of 24V. We wired them in series which gives us 48V. It reality, they put out about 75V on a sunny day. But our charge controller allows us to charge a battery bank from 48V all the way down to 12V with the same solar panel set up. We'll talk more about our charge controller later. The second voltage rating is the maximum power voltage (Vmp). This is the highest voltage the panel can produce while connected to a system and operating at peak efficiency. As mentioned above, the max our panels will produce is around 75V, even though we talk about them as a 48V panel system. The third voltage is open circuit voltage (Voc). This is the maximum voltage that the panel can produce when not connected to an electrical circuit or system. Voc can be measured with a meter directly contacting the panel’s terminals or the ends of its built-in cables. Panels also have two different current ratings: current at maximum power (Imp) and short circuit current (Isc), both listed in Amps. The maximum power current is similar to Vmp: it’s the maximum current available when the panel is operating at peak efficiency in a circuit. Ours can produce 35Amps at max efficiency, They consistently produce 30A on a sunny day and we've seen as much as 32A. Similar to Voc, the short circuit current is the current measurement your meter would show when in contact with the positive and negative terminals of the panel while not connected to a system or load. All these voltage ratings and current ratings are often found on the back of a panel. Use them to estimate how much power they will be able to produce. Rated Watts / 3 will get you approximate Ah/d @ 12V. So, according to this, our 480W panels should give us 160aH on an average day, which we've found to be quit accurate. Although, we've only ever needed more that 100Ah of charge on one occasion. So usually, our batteries are charged back up before lunch, and we spend the rest of the day on "float" charge. These are single silicon cells grown into larger crystals, then cross-section cut into small wafers to form individual cells that are later joined together to form a solar panel. This cell type has high conversion efficiency which means it takes up less space on deck. These cells are generally not shadow protected and are often more expensive per watt. These cells are also single silicon cells constructed by utilizing multiple amounts of smaller crystals to form a cell. This cell type has very high conversion efficiency but is also not shadow protected. Although, you should really be installing any panel so it doesn't get blocked by shadows throughout the day. It will drastically increase the output if you install them in a proper location. These are the most inexpensive to manufacture. They are produced by depositing an active silicon material on various substrates like stainless steel sheet. The conversion efficiency is not as good as the single crystal type, but Uni-Solar panels are this type of panel and are shadow protected. Shadow protected means that a panel continues to charge when part of the cells are in a shadow, like a stay, which is a great advantage on a sailboat. Our Charge Controller . . .
is at the heart of it all. "We have never gone 24hrs without fully charged batteries." The next, and possibly most important component in our charging circuit, is our Midnite Solar KID charge controller. This thing is amazing. Midnite also joined our Uma Angels Family when we asked them to send us a controller and they agreed. We spent a lot of time researching solar charge controllers and learning all about PWM vs MPPT. Bottom line is, if you can afford it, get the MPPT controller. We chose the Kid because it's just the most efficient at collecting power from your panels. It is also easy to program and understand. We currently run it at 12V and just rewire our motor bank to 12V when we need to charge it. However, we will soon be adding a smaller, simple 12V charger to the "load" circuit of the Kid. This will allow the Kid to be permanently charging the 48V house bank. But, when it is full, switch over to the "load" circuit and charge our house bank through the smaller controller. It may all sound too complicated now, but once it's installed and working, we'll be sure to share everything with you in more detail. On a boat, where space is at a premium, you need all the efficiency you can get. Right now, I’m sitting on the boat, it is overcast and raining outside, it’s noon and we’re getting around 100W of power in from our panels (about 8-9A @ 12V). Our house bank will be charged back up by dinnertime, same as the last few days, and we haven’t seen the sun all week. When it is sunny, our house bank is usually charged back up before we wake up in the morning. No we don't wake up THAT early, usually around 10am, but seriously, if it's sunny in the morning, we put 30+aH into our batteries before 10am. The charge controller runs silently, however it makes a tiny click when it switches from "resting" to "BulkMPPT". Since on a boat, we're attuned to every tiny sound, we usually here it click on and off a few times before the sun even rises. Mind you, it's only putting in 0.5aH then, but still, the sun isn't even over the horizon yet and we're already charging our batteries. Check out "Step 26" when we install our solar panels and charge controller. The rule of thumb we used when designing our system is that 1 - 100W panel can charge a single deep cycle battery from 50% discharged in a single sunny day. So we have 6 batteries, so ideally we would have 600W of solar. Now, that just wasn't practical for us, so we settled for 480W and it keeps up just fine. However, if we discharged our motor and house bank down 80% we would need about two sunny days to get them both topped back up fully. Or, about 4 rainy days. For us, this isn't an issue since we typically use the motor for very short periods of time right before anchoring or when setting off for a multi day passage. So, by the time we need them again, their both fully charged and ready to go. If not, we'll just hang out and drink a beer. So far it’s never been an issue or even come close to it. We have never gone 24hrs without fully charged batteries. Many have suggested we have a small generator on board as a back up, just incase there is no sun for many days and our batteries are dead. So far, we have gone a full week without sun and our solar has kept up just fine. Although, we may design a system with the ability to be hooked up to a genset for extending motoring, like say the Panama Canal, so that if we ever needed to, we could just set a generator on deck for a few days and then get rid of it as soon as we're done. But, for now the whole point was to get away from petrol dependance. So far, solar is our only means of power production. We do have plans to get working regeneration from the prop while sailing. The possibility is definitely there, and we have tested for voltage while sailing. But as of today, we haven’t hooked up a charge controller to it. Mainly because we just don’t need it…yet. Our power requirements are so minimal and we use the motor so little, that we haven’t bothered to hook it up yet. But, it is on our short to-do list. So stay tuned for future updates. HERE is a link to a great forum talking about solar systems, battery banks and how to balance them. HERE is a decent, video describing the difference between PWN and MPPT. HERE is another article explaining the differences between the two. How far can you motor? Maybe the most asked question we receive. It's a valid question for sure, and one that many have asked us. But, we have yet to find out. We are still early on in our testing phase of the experiment. We've used the motor many times but rarely for more than 10-15 min and never more than 30. It is also hard to find "ideal conditions" to test in. There either isn't enough space, time or light. Or the tide and wind aren't in our favor. Sounds like excuses we know, but it's the truth. From what we have done, we can tell you this. Our max speed has been right at 4kts. but it was against a slight current, maybe 1kt max. So, that would mean our theoretical top speed is closer to 5kts. Here again, we haven't actually found out. Mostly because without a tow boat right beside us, it would be dangerous to run out of power in the middle of a channel or bay where there are "calm conditions". But, we've motored for 2 nautical miles at 3kts (with a 1kt tide in our favor) and it drained our batteries down to 70%. So, that would mean that in "ideal conditions" we could motor at 2kts for 6 nautical miles. Doesn't sound like much, we know. But, with a favorable tide and even a slight favorable wind, we can extend that tremendously. We also wait for the wind and tide to be favorable and then just sail to where ever we need to go. With limited area to mount solar panels and without a genset, we knew if we used more power that we could generate, we would always have dead batteries. So, from the beginning, we focused more on how much power we could consistently generate, and base our system off of that. To us, the meant using less, not necessarily making more. Our solar has kept up great so far, but our power needs have also been minimal. We have autopilot and a chart plotter that are always on when sailing. We also use our laptops constantly and run a small inverter for tools and small cooking appliances like blenders. We have all LED lights too. We don't have a refrigerator yet or windlass. But they are on the short list. We also have yet to capture any power from the prop while sailing. So there is still room to capture more power if we need it. As we continue to sail further and upgrade and modify our system, we will also continue to update you on how it all works here. So keep a look out for updates on our Facebook page and in future videos. We may have a spinning Motor . . .
but the fun has just begun. "We have a few more project on the list of upgrades and modifications." Well, our motor works. It pushes our boat reliably. The Electro-Beke experiment is a success, at least in our eyes. Now the real fun begins. We’ve proven to ourselves that we can sail further that we thought and use the motor less than we originally planned. So, what’s next? We have a few more projects on the list of upgrades and modifications. The first thing on the list is to rewire our system and remove the redundant components left over from the direct drive phase. After that, installing some better gauges and monitoring systems would be really nice. There is a “fuel gauge” we would like to install for the motor bank and house bank. It is simple and relatively smart. It will give us an accurate state of charge in a quick glance. Next on the list will be installing a charge controller or developing a similar system to allow us to capture power from the spinning prop while under sail. Technically our motor is capable of it, and early tests have augmented this theory. We are currently working with a few companies to figure out what the best system will be. We also need to install a larger heat sink for our motor controller. The one that came with it is designed for air movement across its fins and is therefore undersized for our needs. However, we may be upgrading to a true SEPEX motor controller before long, so it will handle regeneration and would require a different heat sink anyway. The big ticket item on the list is to install a large LiFePO4 battery bank. We have our eyes out for a salvaged Nissan Leaf or Chevy Volt that still has its battery bank intact. We’ve seen them for sale before and would love to get our hands on one. LiFePO4s are much more stable than other types of Lithium Ion batteries. But, we’ll talk about that if and when we actually get our hands on some. If we you would like to know more, ask questions, read what others have to say or just share your ideas, head over to The Electro-Beke Forum and get started!